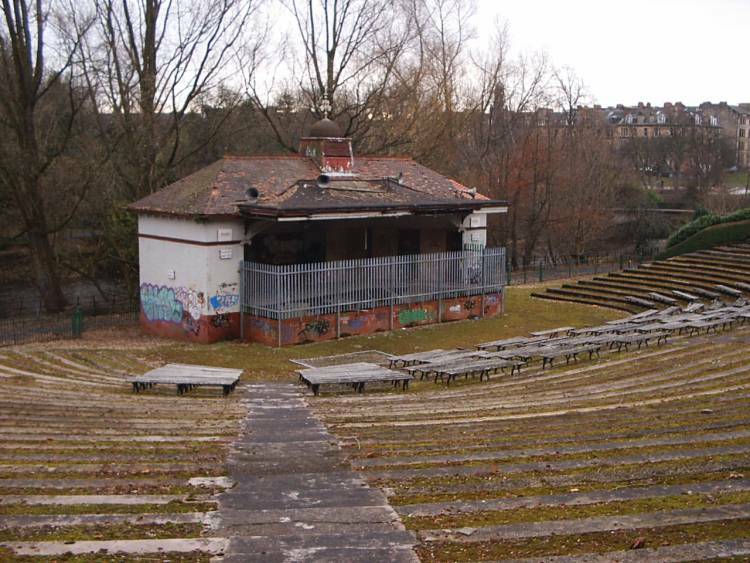 Now will MSPs back bid to save Kelvingrove bandstand? How can it cost half a million? I'd like to hear exactly how thats justified. It's like the demonstrators recently removed from the site of a future bypass.... how can it cost £100,000 a day? Yeah, i think the cost for the bandstand is absolute twaddle, but your post reminds me of walking through Kelvingrove park this week and seeing the graffiti on the Stewart Memorial Fountain and thinking how i'd love to just go home, get my rubber gloves and some detergent and give it a good scrub. Of course, i'd no doubt get done for criminal damage, while the little f*****s who put the graffiti there in the first place get away scot-free. Considering it was only 18 years ago that the fountain was renovated it is time something was done about cleaning it up. I have fond memories of going to the Bandstand at the May Bank Holiday for the Radio Clyde Glasgow Bands gig on the Sunday. Can't recall all the bands but do remember the Henry Gorman Band playing there. Alex Glass wrote: Considering it was only 18 years ago that the fountain was renovated it is time something was done about cleaning it up. 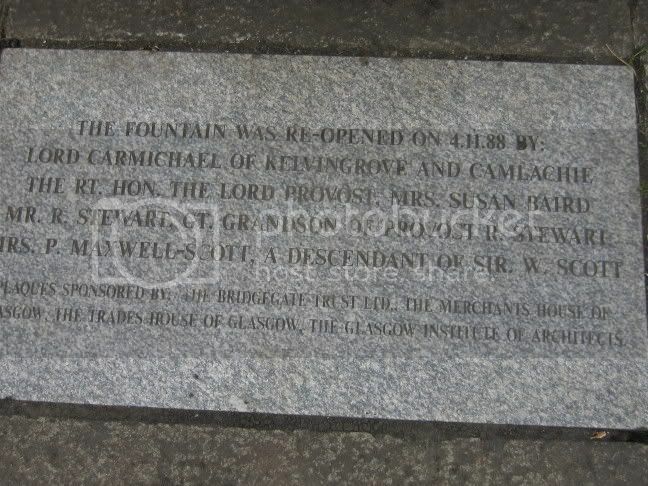 Forgive me if this has already been covered elsewhere, but there seems to be some myth surrounding the Stewart Memorial Fountain. It was renovated (again?) far less than 18 years ago. I could be very wrong here, and my memory is probably somewhat skewed, but i seem to remember some hoopla about it being brought back to life (ie. plumbed in again!) around 3 years ago. I do remember that it was surrounded in chipboard for ages (and i'm sure that wasn't more than 5 years ago). As you can see the fountain is fully operational and free of graffiti. Point being that these things always seem to start off with the best of intentions but just fall by the wayside. Alex, isn't there anything us civic-minded folk can do (and i mean practically, hands-on) to keep our localities looking respectable without being confronted by red tape and H&S bulls**t? I pay my council tax, but it obviously doesn't seem to be enough. I was embarassed when i passed two Japanese tourists taking pictures of the graffitied 'Bengal Tigress' sculpture in Kelvingrove Park last week. As i mentioned previously, i'd happily clean it off myself, but i'd no doubt end up being slapped with one of these ubiquitous £50 fines that the council are suddenly handing out for all manner of "crimes". I believe that the building is structurally unsound, due to water ingress over a prolonged period and that the terracing is also in a very poor state and unsafe. The folk behind the West-End festival had wanted to use it by building a temporary stage just in front of the existing building but were told that they would also have to install seating due to the condition of the terracing which introduced prohibitive costs and therefore the plans for its use had to be abandonned. 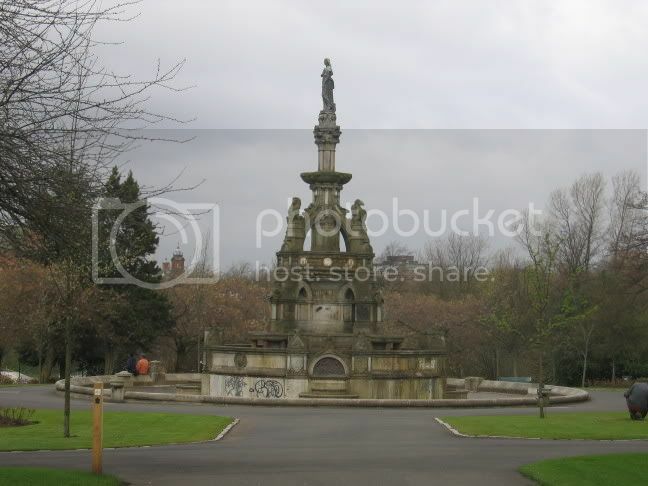 Yet another of Glasgows dear green places, being neglected by our caring City fathers. Caring for what I ask, low council tax and a ruined Cityscape. Well why not use the money generated from the petty criminals, dog crap fines, smoking fines, litter fines, running parked car fines, etc., etc. to pay for the development of a cleanup glasgow campaign with a forced labour scheme of people on community service orders. 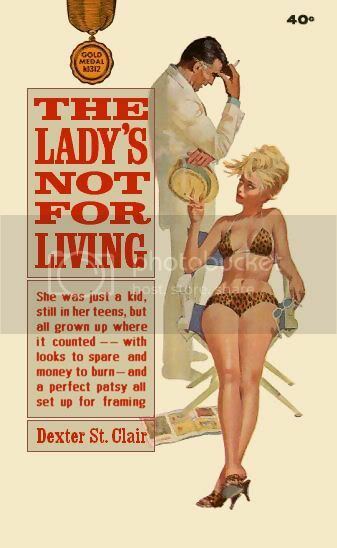 Councils have always argued that they could not afford to make full use of the potential of the community service orders issued by the courts resulting in those who get such orders being asked to do completely futile jobs and take sessions in anger management etc. hmmm... dosent look to have any architectural significance other than its spire, to save it and preserve it would be a waste of time IMO, i say bring it down and replace with a modern structure so that the money is justified in a new build with modern sound facilities for bands. seating areas definetly need redone with some coverd areas for the rainy seasons. Anyone see the news articles around January about the clandestine gardeners and landscapers in England who wait for nightfall and then landscape neglected public spaces? I recall reading a thread about parks on here a couple of weeks ago which went a bit awry, but i think it was jobwhitsit who made a good point about years ago there was parkies who had the parks well monitored. I remember when i was a kid in the late seventies and early eighties, that Elder Park in Govan and Govanhill Park amongst others were immaculate. Surely prevention is better than cure. Maybe if the public spaces were better "policed" there would be less of a maintenance issue. Another example of Glasgow City Council false economy. You don't want to be poking around Kelvingrove Park after nightfall! I realise i must be a bit mental, but i love Glasgow and i'm fiercely proud of it, and i do have a belief that if you want something doing you might as well just do it your friggin' self. Hence my comments above regarding cleaning up the statues in the park. Oh, another thing. Everytime i pass the Cameron Memorial Fountain at Charing Cross i just want to take a wire brush to the lichen and weeds growing out it. God, i am mad. Not on the stone, just on the lichen. Sorry for the delay in getting back to you dazzababes. I was surprised to see tourists taking photos at the fountain at 9.30am. I also got a pic of the tiger check out this topic. There were workmen in the park when I took the picture and to see what other people have said you woulld think the Council is doing nothing to maintain our parks. I am not saying everything is right and we do need to do more, better. I will pass on the photos I have to the department together with your comments. I also took some pics of the Sir Charles Cameron Fountain at Charing Cross. Check out this topic. Again I intend to raise this with the department. In answer to your question I would urge you to keep notifying the Council of your concerns and if you don't get a response contact your local Councillor.